Maria felt compelled to make a big pot of lamb stew one winter morning. By afternoon she knew why. 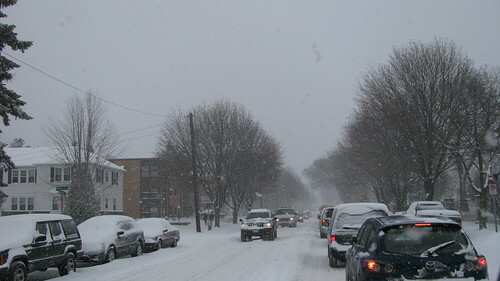 A blizzard paralyzed city traffic. Right down the street from her home a bus load of passengers became stranded. Maria perked coffee for them—pot after pot–and invited them into her home for the lamb stew. Gratefully and incredulously they came, about half a dozen or so at a time. The driver was the last to be served, with the remaining spoonfuls from the bottom of the pot. Maria never even got a taste! But it didn’t matter. Her heart was filled with gratitude that God had prompted her to make that stew. He enabled her to help twenty-plus stranded commuters and show them the love and grace of God. Gordon burned his hand severely—so badly the doctor said he’d probably have to amputate several fingers. But Gordon’s mother and many others prayed, and day by day the hand got better—not worse. Today, you have to look close to even find the scar. Nita often wears a favorite pair of gold earrings, given to her by her children. One day while golfing with her husband, she lost one those precious earrings. Nita was heartsick. A few days later, these avid golfers were again on the course. Nita prayed. “Father, I don’t know where that earring is, but you do. Please help me find it.” On the twelfth green, when Nita walked up to where her ball had landed, she saw something glinting in the grass. Not one foot from where her ball landed, there was her earring. 1) God’s Word is true. God is loving, gracious, faithful, and powerful. 2) We are never without hope. 3) God keeps his promises. 4) God continually blesses his children. Do all of these facts mean we can expect God to intervene in every difficult circumstance? No. We’d become very spoiled children if he did. But the number of times God does provide miracles goes beyond coincidence. They are indeed God-incidents. Yet we cannot ignore the times God does not answer our prayers as we’d wish. Sometimes he does not step in to provide and protect. He does not always solve our problems for us. It’s in those situations that God works a different set of miracles: patience and perseverance (James 1:2), growth in godliness and spiritual strength, his compassion and mercy (James 5:11). Such statements might sound glib to someone recently bereaved of a loved one, or an innocent person suffering unfair circumstances. But there are powerful God-stories from suffering saints as well. G. lost her husband recently and was terribly insecure about living on her own. But God revealed his presence to her in a powerful physical sensation of warmth through her whole body. Although still grieving, G. has felt surrounded by God’s peace and empowering presence. K. had always dreamed of getting married, creating a home, and raising several children. Then came her fortieth birthday. It appeared that dream was not going come true. Depression seeped into the corners of her life, even though she was a woman of strong faith. But day by day, the truths of God’s Word fed her spirit and hope began to grow again. Not the hope of marriage and a family, but hope in God’s plan to prosper her, to give her a future (Jeremiah 29:11)—albeit in a different direction. In the final analysis, these miracles are the most wondrous of all. They are miracles of transformed hearts. “Our troubles have always brought us blessings, and they always will. They are the black chariots of bright grace” – Charles Spurgeon. Hi Nancy, I miss seeing you but know you are enjoying your precious new granddaughter. I loved your message as always. There was only one picture, that of the blizzard. Were others supposed to show? Enjoy loving your new one. Yes, enjoying the baby immensely, but have been laid low by a secondary bacterial infection, after the flu bug of ten days ago. What a nuisance!! That’s the biggest reason for only one picture–too worn out to look for more! Am on the mend again. Just asked Steve this morning if there were any updates on your daughter-in-law. On the original copy, there were large spaces between the stories. With the one on this page, there are not. I think one picture was just fine. Those large spaces did not show up in the “edit” format. Thankfully my son figured out how to get rid of them! Oh, Nancy, the last line by Spurgeon, ‘black chariots of bright grace…’ I’m gonna remember (steal) that one. Thank you for sharing these inspiring God stories. “Inspiring,” yes. Such stories inspire my faith in our creative, attentive, powerful God who is constantly providing for our needs . My heart gets an uplift every time I hear of such an experience! So glad you liked the Spurgeon quote. I know he’s a favorite of yours, too! Thankfully I am on the mend! Started feeling much better yesterday–the antibiotic finally kicked in. Babysat today, so E. & H. could go to lunch with friends. Nana heaven. Miss you, too, dear friend! Uplifting post, Nancy! I call the God nudges or God-incidents. amazing stories. Yes, I like the term, God-incidents, too. Such revelations of his love, power, and creativity in our lives always inspire renewed faith and spiritual resolve. Praise him for his gracious attention that will never end! I LOVE this song, too. In fact, another woman at our church and I sang it as a duet. The words speak truth simply yet profoundly, don’t they? Especially in context of the story behind the words. As I recall, her husband is now disabled after an accident, which occurred not long after they were married. Thank you for sharing this excerpt, Jeremy–a beautiful expression of the blessings that come through trials. Loved these God-incident stories. ‘K.” sounds a lot like me. And Jeremy’s quote of ‘trials of this life are Your mercies in disguise’…very appropriate to your post and applicable to me. Glad you are on the mend, Nancy! Thank you, Cheri. I thought of you, too, when I heard K.’s story. Isn’t that song powerful? It really touches the heart, no matter what kind of raindrops may be impacting one’s life. There ARE blessings even within the storm. Hallelujah!